Make your own lotions, lip balms, perfumes and more! What's more fun than having your own Spa Party in the convenience of your own home! 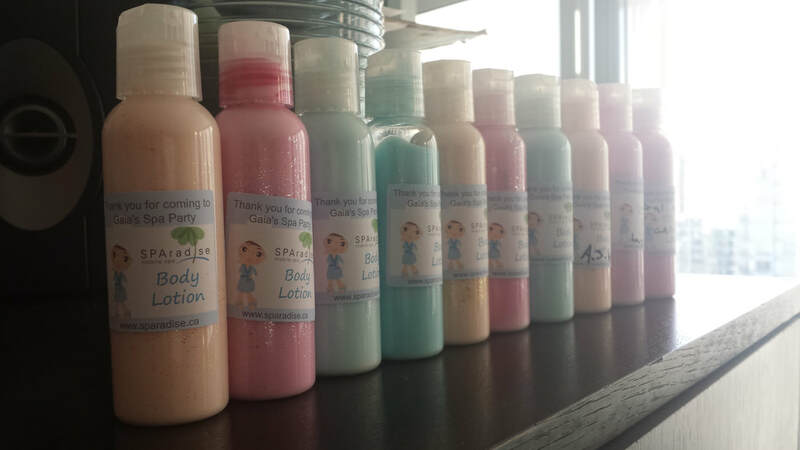 Kids love mixing their own lotions, gels, and making their own creations. What better way than to combine SCIENCE and FUN activities at the same time! They can have lots of fun using ingredients to make fresh products like body lotion and bath salt! Beauty Crafts are great additions to a goodie bag. 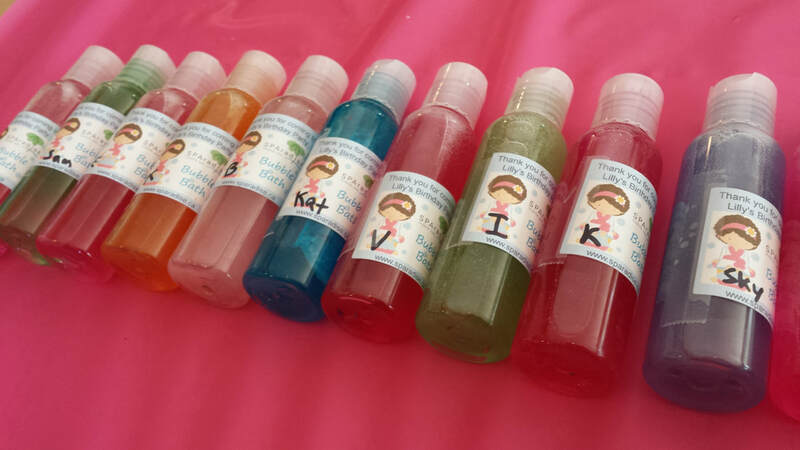 ﻿﻿﻿*All of our beauty craft products come complete with customized labels with the birthday girl's name. **Please note: Our Beauty Crafts are self-serve activities. It comes with detailed instructions. A simple but great way to apply your choice of fragrant oils to make you smell great! You can mix up to 3 of your favourite fragrants, and add flower petals or flower buds to make the roller look nice. Make your own moisturizing lip gloss using ultra rich and creamy natural ingredients. Combine pre-made lip gloss base with cosmetic grade mineral mica for colouring and your favourite food grade flavour, then pour into your own lip gloss tubes. Create your own nail polish with our "3 Free" nail polish base. Combine nail polish base with cosmetic grade mineral mica and glitter, then pour into your own nail polish bottle. *This nail polish base is "3 Free" - containing no toluene, dibutyl phthalate or formaldehyde. Make your own moisturizing lip balm using natural ingredients. Combine pre-made lip balm base with mineral mica for colouring and your favourite lip balm flavour, then pour into your own lip balm tubes. Moisturize your skin with your own nourishing body butter. Combine rich body butter base with your favourite fragrant oil, and your colour choice. These are rich butters and a little goes a long way! Bubble baths are fun for kids! Combine pre-made bubble bath with fragrant oil, and your favourite colour choice. Glitter-up with your own Sparkly lotion. Mix body lotion base with choice of fragrant oil, your favourite colour choice, and add our cosmetic grade glitter to finish your shimmering body lotion. Create your own bath salts and turn your bathtub into a private spa. Staff Instruction charge per station starting from $20. Aqua, blue mix, brilliant blue, canary, dark purple, fuschia, lime, melon red, neon green, neon orange, peach, red, royal purple. Blueberry, grape, honeydew melon, mango, apple green, lily, violet, plumeria, french vanilla, jasmine, rose garden, strawberry, watermelon, lavender. Berry, blueberry, coconut, chocolate, french vanilla, pineapple, strawberry, banana, watermelon. Blue green, blue lagoon, cotton candy, drama queen, hot pink, lime zest, merlot sparkle, petal pink, romantic rose, royal blue, sparkle gold, sparkle rose, titan maroon, violet. For a complete ingredient list for each beauty craft base, please contact us at info@sparadise.ca. **Beauty Crafts are only available when added to one of our party package.